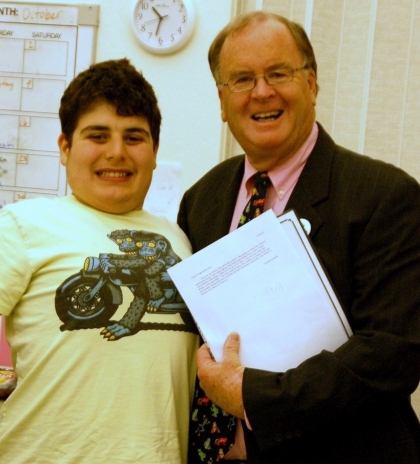 In October 2010, we were delighted to welcome California Congressman Sam Farr to The Bay School. The Congressman learned more about the diverse needs of children on the autism spectrum, and about the importance of intensive, individualized treatment. The Bay School is one of The May Institute’s four special education schools for students with autism and other developmental disabilities. Just as meaningful was the time he and those at the school had together that day. He also spent time with one of our younger students who is non-verbal and has been learning language through picture identification. “It was wonderful to see her excitement when the Congressman praised her for correctly identifying an item on the page,” says Dr. Gold. Later in the visit, this same little girl approached him. She has learned to use a special program on her iTouch (that works as an augmentative picture-to-voice output device) to communicate. She selects words and images, and the device “speaks” for her. The students and teachers presented Congressman Farr with a book of artwork they had prepared in his honor. The book included a story written by 14-year-old Austin, who has attended The Bay School for two years. “When he first came to The Bay School, Austin ’s behavior was very challenging. It was hard for him when he didn’t know the answer or feel confident or competent in his ability to correctly complete a task,” says Dr. Gold. “Today, that challenging behavior has been significantly reduced and he is successfully managing his studies using grade-level curriculum.” Most important, Austin is a more confident and happy child. It was a wonderful visit, and we look forward to welcoming the Congressman back to The Bay School.